At the monthly meeting, each school's Teacher of the Year was recognized and the WCSD Teacher of the Year was announced. Congratulations Mrs. Langley from Worth County Primary School! Each TOTY received an engraved tray to commemorate the achievement. Mr. Bill Settle, Superintendent and Mr. Butch Jenkins, Board Chair presented the gifts. Mrs. Langley teaches first grade at WCPS. She has always wanted to become a teacher. She loves children and as an educator, she strives to make a difference in the lives of all the students in her classroom. Mrs. Langley's belief is that all students deserve an opportunity to receive the best education available. She maintains high expectations for each of her students in order to help them reach their full potential. 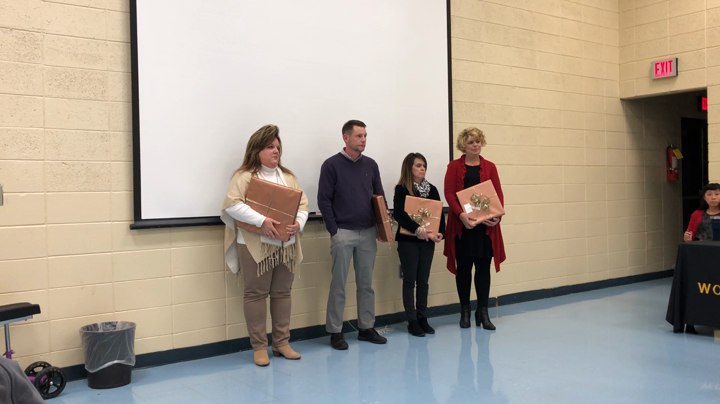 Each school's Teacher of the Year (TOTY) was recognized at the monthly meeting. WCES TOTY, Hank Hobby teaches 4th grade Math, Science, and Social Studies. WCMS TOTY, Sandy Bozeman teaches 7th grade gifted ELA and Social Studies. WCHS TOTY, Tammy Holton teaches American and British Literature.